For 20 years, actor Jenna Fischer has lived in Los Angeles, where she became widely known for her role as Pam on The Office. But she’s always called St. Louis home. When she was younger, many Fischer family events took place at her grandparents’ house, which her grandfather designed, and in which her father grew up. Fischer’s sister, Emily, and Emily’s husband, Dwight, bought the home a few years ago and began raising a family there. “We were all really excited that the house was going to stay in the family,” Fischer says. Recently, Fischer wanted to do something special for her sister, who’s a school teacher, tutor and volunteer for Girls on the Run, an organisation whose mission includes enhancing the self-esteem of young teenage girls. Fischer decided to surprise Emily with a renovation of her home, using Houzz to redesign and furnish the kitchen, living and dining areas. Really well done transformation. I like that Jenna Fischer's brother in law is Dwight. Jenna Fischer, what a precious gift to give your sister. Jenny Rausch is so talented, she transformed my home a few years ago. Congratulations! Absolutely amazing. The house turned out great and this was such a wonderful thing Jenna did for her sister and her family. Such a special moment they can continue to share for years to come. This looks wonderful, and a really great solution to the awkward basement stairs. That is so common in houses, and always puzzled on how to handle it. I love this project so much! It's adorable and very inspiring! Couldn't you publish an article with some pictures of it and maybe also with a floor plan? It would be so much more helpful than my poor screenshots ;) And when is Houzz goint to release it's first coffee table book with it's finest projects?? I love Jenna Fischer!! Even more now that I see that she is such a beautiful , genuine person. That was such a sweet thing to do and you can tell her sister is very deserving. Awesome new space!! How weird is it her father's name is Jim (as in Halperin)!!!! Hi Ankabr, You can save any of the photos from this article to your Houzz ideabooks. Hope that helps! @oleander55 - her brother in law is Dwight! I think this is SUCH a lovely story and Jenna, her Dad, sister and entire family are lovely. My favourite of this series so far. I really like the chevron splash back in the kitchen too. Does anyone know the exact wallpaper used when they first walked into the home? I love this story! So sweet! The designer got all of the kudos but without the great contractor it couldn't have happened. Lets remember the craftsmen too! Besides being a beautiful transformation, this made me cry and write my sister to tell her I love her. awesome transformation. great sisterly love. I love these videos, and this is a great one to present on National Siblings Day. Jenna has always seemed like a class act and this video proves it. Keep these My Houzz videos coming! Absolutely beautiful story...awesome home renovation! Beautiful! I love this transformation! I am was born and raised in St. Louis. Go Cardinals! So cool to watch and experience since it is set right in my neck of the woods. I'm in neighboring Chesterfield and I know this type of house. I've met also met Jenny Rausch on a home tour and seen her work and she is so talented. Karl Bick's work is the best! Such a beautiful transformation - it makes me want to turn to Houzz for help on my own projects. And I would have voted for the TV over the fireplace since I've done it myself with no issues at all. Sweet story! Amazing what this renovation accomplished, it brightened my day. What a remarkable family on top of it, so deserving and appreciative. Thanks Houzz for sharing it. Not only BIL named Dwight, Dad is Jim! Wow!! What a beautiful transformation of their home, so open, functional and stylish. What a beautiful gift for your sister and her family. This is so awesome!! I'm teary eyed watching this it's so special and such a gift!! I loved it!!! I second all the likes! The house really lights up now. And what a nice thing Jenna did for her sister. Love every part of this story. All that work took only two months??? Beautiful story and loved the decoration, details, good taste! I loved this story! I loved everything they did to the house! Beautiful!!! Really nice job! Love your story, very touching! Can u tell me the sketch version uses by the designer? Really lovely, warm and inviting with all the personality of the family living there. I see the "executive producer" is Ashton Kutcher. Man of many talents!! I bought my property for it's barn and turned it into a barn house. So your loft and mine look very much alike, the one added feature I added was a gas fireplace. Four generations have loved that house. What a beautiful reno. I really liked what you did with the staircase. I have not seen that before and it was perfect. The kitchen, too, was amazing. What great sisters. You two are so lucky to have each other. Thank you for sharing. Jenna is an amazing sister❤️ Her dad is Jim, her brother in law is Dwight, and her niece is CeCe! I always loved Jenna in The Office. Wonderful to see she is so sweet for real! Great family, great story, and great transformation! Ok that was such as such a cool, fun and touching renovation! I stopped watching "The Voice" and watched this! Love the love. Nice tribute to a great family. Hi Jenna, I'm a StL girl, too, and tho I've been gone for 27 years, I still refer to St. Louis as my home! Love the photos from the St. Louis area and especially Ballwin. Lovely Emily, her husband and beautiful family look so happy to have this completely updated version of your Grandparents home. Cheers to Grandma and Grandpa, and Cheers to Jenny for making it happen. Jim was great on camera as well as giving a hand-made update to the bookcase. 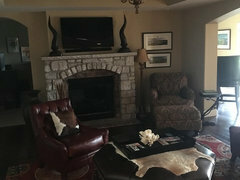 Thanks for all the tips for the Houzz site, I've been a Houzz addict for many years but I didn't realize how I could manipulate their content for my own home! Fabulous renovation!! A loving, caring sister makes life a lot more fun. Congratulations!! Just so sweet and kind. So nice to see! This was lots of fun to watch. A nice showcase for Houzz and all it can do as well as a nice portrait of a celebrity that loves her family. Sister of the year ! I am motivated ! Great job ! OK, so now I'm crying over Houzz TV. Am I the only one overly invested in the decor and emotions of others? What a sweet, generous thing to do for your best friend and Sis. And such a loving family you have, Jenna. Fabulous makeover! I agree this is my favorite so far as well, you are extremely talented and what joy your brought to Jenna and her family. I am quite interested in finding that sofa, I want one. I don't live in St. Louis anymore but would love to know where I can find one. I love the design but I really love the kindness and love that went into this renovation. I wish this was tv! So @jennafischer 's dad is Jim and her brother in law is Dwight. Coincidence? I wish that i had a designer like Jenna here in the Caribbean, she is really amazing. Thank you Houzz for the video on an amazing house transformation. even though i am 2500 miles away i felt like i am in that house. Lovely. I love everything about it and I'm really picky. Is this the house that Jim and Pam bought? It looks just like it. Four generations in the same house! That is so awesome. I loved the renovations. Very tasteful and functional. I am certain they will love it for generations more! Where can I get those green kitchen chairs??! Love! I can only imagine what Emily will think after everyone leaves and she's all by her self in that beautiful space you all created. What an amazing makeover! I have enjoyed all 3 of these renovations! While I know they are promoting Houzz and their services, it's not in your face pushy advertising but to me very tastefully done. I also appreciate the stories they have chosen, the celebrities are caring family members wanting to do something special for a loved one, not the over the top throwing their money around to impress everyone phonies. The focus is on family and taking care of them, well done Houzz! Hey, I used to work at JPL! Loved that place. Go Jenna! Loved it! Amazing reno, but please tell me you didn't throw away the front door and doorknob! Mid century lovers would be crying! Really enjoyed this wonderful story of the love that felt so genuine between two sisters. Jenna, you're as sweet as I always thought you were and I can see why you love your sister Emily so much. Jenny Rausch, you did a fabulous transformation and you seem like a truly caring person. What a great idea Houzz had to present this. Happy to see Ashton Kutcher was involved with this production. It just shows what can happen when you get so many good people collaborating. Thanks again Houzz! Love this story, but would like to see where they moved the stairs to. This video really shows how Houzz can help you decorate! I have gotten so many ideas for my cottage re-do. I love the green dining room chairs. I have a dining room table that color (that I refinished myself) and I think I will put some colorful chairs around it like in this video. Thanks for the great inspiration!!! Thank you for sharing this personal journey of family, home and love. I live in a town full of McMansions. But I would choose to live in this house instead. Beautifully done! This is a super transformation. Love all the light and lightness. It seems to reflect the personality of the whole family. I would love to know how to get that animal print table lamp! Looked on Houzz site but cannot locate. I loved the whole story! Congratulations!! Spectacular. Its great they worked within the existing footprint. Wow, such a wonderful way to honor your sister Jenna! Houzz and you, made the perfect decisions, so beautiful and homey! Congrats to the family, I had tears in my eyes from, beginning to end. Great Job to all, super excited for your sister, she was honored in a very special way, well deserved, I'm sure! awasome renovation and great job from the team of designer and Jenna. I loved the project and feel so sad that I can't do something similar since I live in Europe, Greece. Nevertheless, I wish they are happy to their new environment !!!!!!! Absolutely love it!!! What a beautiful gift! This was so much fun to watch. We also LOVED the cabinet hardware you used! Beautiful in all ways! I have a sister I'm super close with I know the bond, we'd do anything for each other. We recently did a similar renovation, tore a wall down from our kitchen to our Living Area and redid the kitchen and Living area similar to yours and absolutely LOVE the openness..It's very homey when you have kids..Beautiful piece, Thanks for sharing!! ❤ The Home!!! This was great! Loved the renovation, but also the story behind the house!! Loved the Jenna Jenny project -- great job! Magic chef deserved a herringbone backsplash. Sisters are the best! And so is that cow picture! I have it in my kitchen in NY and got so excited when I saw it on the show! ❤It! Just so cute and loyal. Just like a St. Louis native...reuse, repurpose and pass on the love of generations! Very inspiring story. Love the sisters bond between each other too! ...I learned a lot about Houzz I never knew! i have some projects of my own that I need ideas for, so I look forward to contacting the Houzz pages soon! Wow, what a transformation! Hometown STL pride to Jenna Fisher, what a neat tribute to your sister! Jenny Rausch from Karr Bick hit another design home run. She's the real deal! That was awesome! The house turned out excellent! Glad to see that you kept the memories alive with a re-do of the old to accommodate the new. I'm sure grandpa is smiling down on your family. Cheers to new memories! What a beautiful thing to do for someone you love. Enjoyed the video and all the neat things about Houzz. Such an amazing show, had me crying. Jenny from Karr Bick did an amazing job listening to the needs of the family and I'm in love with the storage solutions for a small space. It's so elegant and inviting. I hope Houzz continues to create shows for us to watch! It's better than HGTV. @divnananta, I like your room! My TV is over my fireplace, too. We love it there!! Love the results! And great shout out for Girls On The Run! Love Jenna Fischer! And what a wonderful family! Would love to see more videos like this on Houzz! i love the sweatshirt that says "nothing ordinary." can i buy that somewhere??? A Wonderful transformation, great to see it unfold. Enjoyed the whole presentation immensely. Well Done Jenna and Jenny and Jim - what beautiful people you all are. Emily, Dwight and children, enjoy your beautiful home and extended family too, they are truly an inspiration. Your Grandparents would love what you have done to the home and the fact it continues to be a nurturing space for your family and shared with other also. Thank you. - Ashton you did good. Amazing! Such a beautiful thing you did for your family and to that home! Kudos to the designer. I learned some Houzz tips and can't wait to use those shopping & visualizing tools. That staircase solution was so great, too. Such a fun watch. Thank you so much for sharing!!! Loved watching this! Amazeballs !!!! WOW! I love how this transformation came out! I loved watching the video and getting to know this family as "real" people. Thank you for capturing that! Additionally, in the past, I've only kinda of scrolled past things I've seen on houzz. Now, because of this video you've helped me to see all the possibilties and things that can be done with this site. I'm excited and NERVOUS to put it all together. Last year in May, I lost my condo (and 3 other units connected to me as well) to a fire. I've been living in an apartment these past 10 months and we are very close to starting the rebuild. I have so many ideas for decorating and so far they've just been something "I think about". Thanks to this site, I'm going to search designers in my area to see if they can help. What a wonderful thing to do for your Sister. The fact that the Home has had 4 generations of the Family in it is awesome. Well done the designer and Houzz!! What a nicely done piece! A sweet family and a great renno. That was a real labor of love and brought tears to my eyes - thanks! Well how special the relationship is between the two sisters. So nice, you made me cry! Well done Jenny & Jenna! What a beautiful gesture and gift for the whole family! I love it, there is nothing, nothing more important than family. Thanks guys for sharing. Well done! I will be using many ideas you implemented here for my own first house! Beautiful work! This is an awesome reno! I recommend Houzz to all my clients. We used it to design our new Master Bathroom and it came out awesome (we even bought the double sink vanity from them). Such a beautiful gift and I love the transformation! I'm curious if anything was done to the room off the garage. Was it made into a mudroom? What a great video, great family, great designer and most of all - done in a way that you felt good after watching it! Beautiful design and thoughtful renovation! Beautiful, comfortable and functional renovation. Love the way you incorporated family items from previous generations. This house is a treasure. Such a marvelous story, family, renovation and designer! Beautiful renovation and beautiful relationship between sisters. Wow! 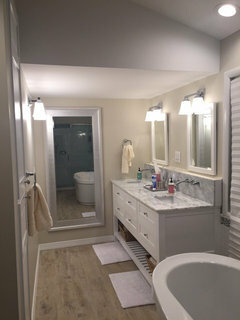 Another great renovation...such an inspiring story that again brought me to tears....keep 'em coming Houzz! What an amazing transformation for a sweet family! I loved this whole story and the end result really knocked it out of the park. I think Jim was the scene-stealer of this show; what an awesome dad and what a wonderful family they are! Make more of these PLEASE!!! Beautiful story ! And the transformation was incredible!!! Loved it! Way to represent our great city of St. Louis, Jenna! This is so beautiful! What a wonderful thing to do for your sister. I love that the house has so much meaning for your family! What a touching story of two sisters. I cried watching the video Amazing remodel and so practical for the family. Well done! Wonderful renovation. The love the family has for each other is so touching and natural. Bravo all around! Ashton Kutcher was listed as Executive Producer. Thee Ashton Kutcher? Anyway, tears came to my eyes while watching this story. It's so wonderful to watch an uplifting story that shows the love in a family. The love that should be in every family. The wonderful renovation and design was icing on the cake. This is so moving and the home is beautiful! This one moved me to tears. Such a wonderful transformation and a beautiful gesture of love from one sister to another. Love how Jenna is keeping it real, it's inspiring. Blessings all! Trying to remember if I was on that TV over the Fireplace thread or not. Right choice, ladies! I also loved how the stairwell was done --- that might have been the best tip I've seen. Congrats!!! Beautiful renovation! Wonderful sisterly love!! Grace and Gratitude abounds!!! Beautiful story of sisterly love! Absolutely love the renovation! Jenna, your love for your sister shows by having this done for her. Kudos to Jenny for not going the subway tile route in the kitchen! The marble backsplash is stunning, and the fireplace came out looking sophisticated. This space will look fresh and hip for many years to come. Enjoy making memories here, Jenny and family. Gotta love Jenna! Love the renovation. She and I have one very small thing in common. Our love of felines. We have both rescued cats and been foster moms for Kitten Rescue in Los Angeles. This was the best story!! I cried all the way through it. I love Jenna!! She and her family are so wonderful!! Thank you for sharing this and all the fun features of Houzz. Awesome video and beautiful home! Love the Midwest. Where did the front door come from? Love it! Love it ALL! Fantastic job! Sisters are the best! What a sweet gesture, nothing more important than family and traditions! Beautiful results. I love the new look of the house! From all the My Houzz episodes so far, this to me is the most accomplished project so far. Beautifully executed, design and practicality have been considered in equal measures - it really all comes together. Just stunning! Awesome transformation!! How wonderful that the Fishers were able to do this for their family home! Loved Jenna on the Office (I was so addicted to that show!) and other stuff so it was great to see this makeover with her family. Now if you can help me with my huge brick fireplace... Lol!! I happen to watch this with my 5 year old daughter, when it was done she said, "That was the best movie! Awe, (wiping her watery eyes) that was so great!" It really did turn out beautifully! Jenna Fischer this was so heartfelt & truly hits so close to home especially since I'm from Saint Louis as well!!! This gift to your sister but your family for generations to come nothing shy of AMAZING!!! You're such a selfless individual & THE BEST SISTER for recognizing ALL your sister sacrifices & showing her it hasn't gone unnoticed. Love the overall look & feel of your sisters NEW HOME. So wonderful to see such a beautiful rendition of family love and support. It is amazing Jenna was able to use her acting career and contacts to save the Fisher family home, great example of a wonderful relationship between two sisters. An extraordinary presentation of the wonderful technology that Houzz has made available to the remodeling and building community. Thank you Jenna and Houzz. Tears streaming down my face..I couldn't stop crying and was overwhelmed with all the love floating around in that family. Beautiful story of family and sibling love. Thank you for sharing. That Jim . . . what a guy!!! - lucky your girls have him as your dad - lucky mum too!! Thank you for sharing your story. It inspired me to call my sister and point her to this site for ideas. There was a kitchen fire Thank God know one was hurt. Houzz is making it a little easier because it is overwhelming. She's just grateful for her family being ok. It melted my heart ! So touched with the feelings and the overpowering love, it truly completes the house. This brought tears to my eyes!!! Wow! What a great sister! They did an awesome job! Outstanding!! Wonderful idea and results….enjoy in good health. Love everything about this reno! great job! can you tell me details on the front door, please? I want one just like it! Absolutely fabulous! Love it all, just wish we could slow down on the actual design. Want to know where items came from, etc. This video made me cry the whole time. What a great family and what a generous loving person Jenna is. Beautiful sister love, beautiful renovation! Love this!!! Karr Bick your work is always amazing!!!!!!! Absolutely loved this story! Wow, 4 generations in the same house, beautiful story! Thanks houzz for posting this. So am I the only one that teared up a couple times? Great story! Great reno! Love it all!!! Gah! Gorgeous family. Amazing space. Love it all. What a wonderful story. And a beautiful makeover. I cried with Jenna as she told her story. You can tell they are a loving family with deep traditions. One of my favorite things was when their dad picked up the little chef on the stove and said, he stays he's been here for years. He's probably covered in grease. I love that, that's life. Please let me know the manufacturer and design of the front door, thank you! @DianneE & @jillpeel the front door is Masonite Entry Door. Vista Grande Flush glazed Full lite/4 lite simulated divided lite 3.5" bar w/ pear glass. What a great story! Love Houzz! I absolutely loved the story.. Cried a few times.. Loved Jenna and her family; May God bless them all. From the designer to the contractor everybody did a great job. Ashton Kutsher producer?? Excellent! Thank you HOUZZ for posting this video. Love, love, love HOUZZ!! Love that they have kept the home in the family. What a sweet story! Love the outcome...love Jenna and her sweet sister. Beautiful! Awe Jenna, You're so sweet to do this for your sister!! I loved the way it turned out and the design was stunning!! I loved seeing how excited your sis was, way to go! I love that her Dad was able to make great contributions . What paint color was used? Appears to be one color tan/beige tone throughout. Thank you. Great remodel job! I have that cow picture “when cows fly” by tori, bought it from Houzz and I LOVE it. I love those rooms there so modern! Love this story and as an Interior Designer myself, I love to see thoughtful design that meets the needs of clients! Nice job Jenny Rausch!